How Hanuman Became a Chiranjeevi? – Why Hanuman Will Never Die? In Hindu tradition, there is the concept of Chiranjeevi – living beings without death. 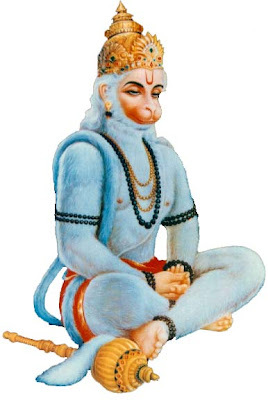 Hanuman is one among the seven Chiranjeevis mentioned in Hindu scriptures. Hanuman became a Chiranjeevi after he got a boon from Brahma, the creator, and Indra, the king of Devas. This is the reason why Hanuman will never die. Legend has it that Hanuman in his childhood reached for the sun thinking it to be a fruit. Indra, fearing Hanuman might swallow the sun, used his thunderbolt to stop Hanuman. The thunderbolt struk Hanuman on his cheek and child Hanuman fells on to earth unconscious. Vayu, the Hindu wind god and father of Hanuman, picked him up midair and went into a cave. An angry Vayu avenges this attack on his son by removing air from earth. Soon all beings suffocate. Terrified, Devas approach Brahma. Soon Devas and Brahma reach the cave. Brahma revives Hanuman. All the gods present their give Hanuman a boon each. Brahma gave Hanuman the boon that he will never be killed by a weapon. Indra’s anger also changed to affection and granted the boon that Hanuman can summon death as and when He desires. Please note that there are also other stories which narrate Hanuman became a Chiranjeevi as a result of his constant and unwavering devotion to Sri Ram.